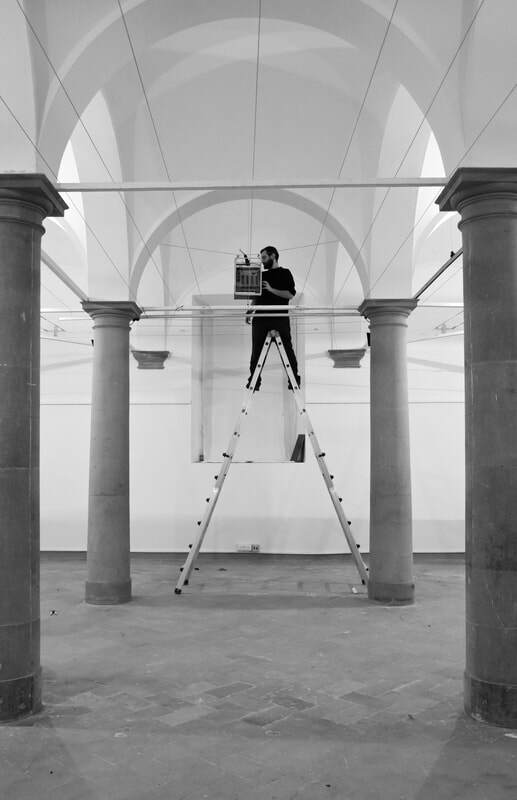 Francesco Pellegrino is a Florence-based multidisciplinary artist and musician, whose works include electroacoustic and electronic music, performance and interactive – multimedia installations. In 2008 he developed and produced an electromagnetic transducer capable of transforming every surface into a loudspeaker; with this technology he created compositions for real instruments, resonances and vibration; this transducers will be used by the artist and composer Daniele Lombardi for his composition “Le son de ténèbres” in Palazzo di Fontana di Trevi, Rome in 2008.
he participated with his reinterpretation of the piece “Cartridge Music” for Theremin and live electronics. In collaboration with the musicians Luca DiVolo and Luisa Carpignano and the scenic artist Anita Barghigiani he created and played the performance “Real Virtuality”, for guitar, saxophone, piano and interactive stage objects; this performance was realized for the festival “Le sabbie del tempo”, Florence, 2012. In 2013 Pellegrino built the installation “Inner waving”, where eight tubs filled with water became loudspeaker, showing the sound vibrations in the visual field, creating a meditative and complex environment. The installation was presented as an interactive and responsive stage for a guitar and live electronics performance, in the Fonoteca Nacional, Mexico D.F. Later on, this installation was presented in various locations: STOFF (Stokholm Fringe Festival), Semiottagono delle Murate (Florence), COMBAT Price, (Fortezza Vecchia, Livorno). During a residency in the research center Tempo Reale in Florence, he developed a software for the project “Universo di piccole cose”: a software capable of sampling live sounds and using them to create complex and stochastic soundscapes. In 2015, with the musicians and composers Andrea Venturoli and Maurizio Montini, he created the 3D3 trio, producing 3D audio music with instruments and a synthesizer; with the trio he played during various live performances in Italy. In 2016 he won the call for “Progetto RIVA”, by MUSE in Florence through the project “Vivente”: an installation where 128 bamboo canes play like organ pipes and like marimbas, controlled by a stochastic software; the canes were suspended above the exhibition space and the audience was invited to walk through the space, in an immersive sound and visual experience. The calm and static environment allowed for contemplation and meditation on complexity, in a non-critic state of mind. 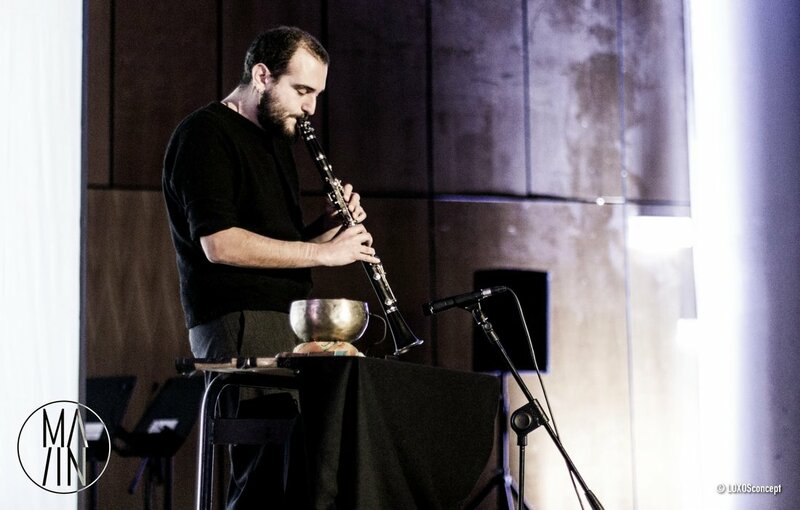 Since 2017 he’s been collaborating with the research center Tempo Reale, founded by Luciano Berio, for performances played during the Venice Biennale 2017 and the Maggio Musicale Fiorentino. As a musician and composer Pellegrino has played in various festivals in Italy with his pieces for instruments (trumpet, saxophone, clarinet, various little percussions, guitar) and his live sound environment building softwares to create live soundscapes. He was a finalist in TU35_Expanded contest for the Pecci Museum in Prato; he played in MA/IN Matera Intermedia Festival, Tempo Reale Festival with Marco Baldini (trumpet), and others. In 2018 he created three installation series called “Nidi” (nests): igloo-shaped structures, each one made of a different material (wood, metal, paper), where eight transducers created a little multidirectional environment; the audience could experiment the installation wrapped in a small, intimate space, a place to discover a deep perception of sound and material. “Nidi” was first presented in “Firenze dei Bambini 2018” in Le Murate PAC and was brought to life in collaboration with illustrator and scene artist Anita Barghigiani. These installations are places for contemplation, the highest level of interaction that human being have. One of the “Nidi” structures, the wooden one, is in permanent exhibition in Le Murate Progetti Arte Contemporanea, Florence. He participates to the residency program by Toscanaincontemporanea 2018, going in Chongqing, China. Here he creates and performs “Matter,Vibration,Space”, a music piece composed around the research on matter, playing a wood and a metal sheet which create complex environments through a stochastic based live electronics. Performed in Dimensions Art Center, Chongqing. He creates “Rain Drops”: a public art installation, created in LiuYin town, Chongqing; the installation is made by local materials, a series bamboo canes which hold handmade grey tiles; through a bamboo structure, water is brought on each tile with regulated drops. In each cane there is a little microphone and speaker for a slight amplification of the drop hitting the tile. The bamboo canes and tiles are placed along a little road, which brings to a Buddhist temple. The different drop rates and position creates a constantly changing sound and visual walk through nature. The installation has been created during the workshop organized by Sichuan Fine Art institute and Rural Research Academy of Chongqing. “Rain Drops”, public installation; a series of bamboo canes holding a tile, on which a water drop is spilled, creates a constant changing sound and visual walk. The installation has been created in LiuYin town, Chongqing, China. “Matter – Vibration – Space”, concert for wood and metal sheets and soundscape creating software. Performed in Dimensions Art Center, Chongqing, China. “Immerso/Controluce”, Inner waving installation accompanied by concert for giutar (Marina Tomei), compositions by Francesco Pellegrino and Juan Angelus Pichardo, Fonoteca Nacional, Mexico D.F.